The solvency and liquidity situation of German automotive producers and suppliers is robust in general. However, margins are decreasing due to increased material and labour costs, rising competition, pressure on sales prices and the need to invest (high capital expenditures in research and development are necessary to stay ahead of competition in new trends and technologies, i.e. electric motors, connected driving, autonomous cars). Given the good results in the past, the majority of companies still have adequate equity positions to cope with this. However, there are a large number of small companies in the supplier subsector which could face higher business and credit risks in the future, due to low leverage in negotiations with OEMs or if OEMs stop ordering from them (delisting). At the same time, competition is fierce in some segments. Many small businesses have difficulty funding the funding necessary for further growth or to climb up the value chain. German OEMs producing in the US could be affected by higher prices for commodities due to US punitive tariffs on steel and aluminium, as there are doubts that US producers can provide the quality and volume required in the short-term. Given the importance of the US market for the German automotive industry the imposition of tariffs on car and car part imports could severely impact certain German OEMs and suppliers (especially those that have no production plants in the US). Our view of payment behaviour in the sector has been good over the last two years, with no increase in the number of non-payment notifications in the past 12 months. The insolvency level is expected to remain low for the time being. The average payment duration is 60 to 90 days. However, we have recently observed that some Tier 1 suppliers use their market power to increase their payment terms to 120 days. 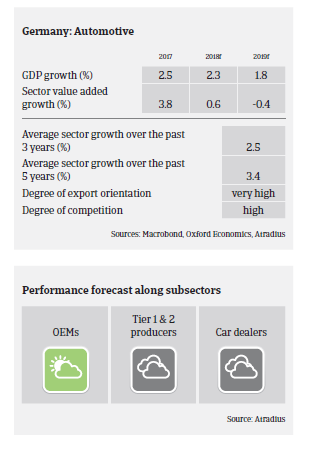 Given the major challenges ahead (emission curbing, new technologies, changing consumer habits, mounting trade disputes) we rate the German automotive sector as “Fair”. Our underwriting stance remains open for OEMs and Tier 1 suppliers, which usually have good access to capital markets and face a very low default risk. However, we take a neutral UW stance on Tier 2 businesses due to lower equity ratios in this segment and because many products are substitutable. Should the US impose tariffs on automotive imports and the ongoing trade disputes escalate, it cannot be ruled out that suppliers could face liquidity and payment issues.